We could all be more vigilant and cyber-aware these days. Many of us have been the victim of hacking, malware, or identity theft. And if it hasn’t happened to us, we certainly know someone who’s had it happen to them. Here are a few suggestions to become smarter when using your smart phone. Protect your mobile account with a pin number. Not only should you utilize a password to open the phone itself, but you should also set a pin with your wireless provider. This serves to protect your account and identity whenever you contact them for assistance or customer service. Be proactive if your phone is lost or stolen. If you misplace your phone, immediately search for its location using another device – such as a tablet or computer. Android users can access their “Device Manager” through Google. Simply sign into your Google account and select “My Account.” Click on the “Find My Phone” tab and follow the prompts to either locate the phone or, if it’s stolen, lock it and wipe it clean. iPhone users can log into their account using their Apple ID and utilize the same functions. Update the operating system on a regular basis. Check for updates at least weekly and be sure to upgrade your phone’s operating system as suggested. Hackers and viruses find their way into a phone much more easily when not regularly updated. Back up your phone on iCloud. If your phone needs to be “reset” or wiped clean due to loss or theft, all of the information on that phone will be lost. However, regularly backing up your phone will save all of your photos, apps, and music and you’ll be able to easily reinstall them on a new device. Install antivirus apps. If you use an Android phone, antivirus apps are a must. Gadget Guardian (powered by Lookout) is one suggestion. However, there are many others that also do a good job. Download apps only from official sites. Google Play is the official site for Android users and either iTunes or the App Store for Apple users. Downloading from other sites will subject you to unnecessary risk. Avoid connecting to free Wi-Fi. It may be tempting to surf the Internet or get some work done while you’re sipping a latte at your local coffee house. However, hackers have a field day in these environments. If you want to use your laptop at these locations, use the “Hot Spot” feature on your phone to tether your laptop or tablet to the Internet. Providers usually charge an extra subscription fee or data charge for this service, but it is well worth avoiding the headaches of being hacked. Turn off blue tooth when not in use. Hackers can use this feature to gain easier access to your phone. Consider encrypting communications whenever possible. 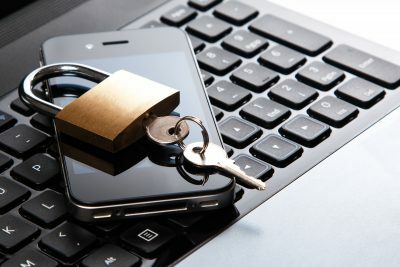 If you have an iPhone, you automatically have encrypted messaging whenever communicating with another iPhone user. Other options are “secret conversations” on Facebook and Whats App. Both people need to have this app on their phone to encrypt their messages each way. This entry was posted in Economy and tagged Android, cell phone security, cyber security, hacking, iPhone. Bookmark the permalink.